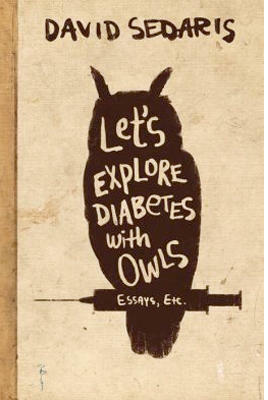 In the days leading up to the Great Humpty Dumpty Schonda of 2013,I had started reading David Sedaris’s latest collection of essays Let’s Explore Diabetes With Owls (Little, Brown, and Company; $27). Since I possess Jedi-like library skills (if there is such a thing, and I am inclined to believe that there is), I was able to snag a copy of the book from the country library as soon as the delivery of the books came in-- you really have to time the book’s release date to the library’s order date and entry of the book into their online catalog . . . Anyway! After getting released from the hospital earlier this week, I returned to my reading and was happily able to finish the book Saturday afternoon. As with all Sedaris books, I enjoyed Owls a great deal: Sedaris is at his best when speaking about his own foibles or the pitfalls of being an American abroad. An avowed Sedaris fan, I’ve read all of the author’s books since discovering them during my sophomore year of college; coincidently, Sedaris gave a lecture at my university during my sophomore year . . . but I was off having my Razor’s Edge experience and was totally unawares until more than a year after the engagement (waaah!). It is within the context of this tremendous admiration and fandom that my mixed feelings about the book must be considered. 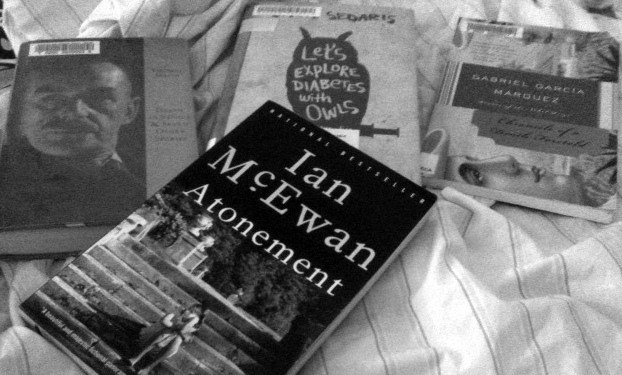 As a general collection of humorous essays, I LOVED Owls; as a David Sedaris collection of essays, I was mildly amused. For many Sedaris fans, myself included, consider all of the author’s books since his masterful Me Talk Pretty One Day (2001) to be anticlimactic. Me Talk was so humorously off-kilter and touchingly relatable that none of Sedaris’s more recent work can live up to the brilliance of that book. Really, it’s unfair to consider the rest of Sedaris’s work in comparison to Me Talk, but it’s also hard not to compare the works. That being said, Owls is the best collection Sedaris has released since Me Talk. In particular, I enjoyed Sedaris’s wild take on eating during a vacation in China, an entry that has caused some controversy but one that I, as a member of the pearl-clutchers brigade, relate to wholeheartedly. Similarly, the author’s discussion of his French dentistry experiences and the fallout from having his computer stolen in Hawaii had me laughing out loud in the most awkward of circumstances-- thank you, David. Where Owls, and all of Sedaris’s work, falters are in the short stories which strain for laughs, often launching themselves into blue-territory, and, for the committed reader, are best plowed through rather than savored. So, while imperfect, Owls is a fun read, particularly for commuters accustomed to having short reading spells. However, would I have shelled out my hard earned teacher shekels for the hardback at full price . . . probably not. I’d advise adding this one to your library hold list.